The Wearable Tragedy mask was created for a musician in the United Kingdom in 2005. This traditional Greek Theatre mask is designed to be worn rather than act as a wall decoration. The large open mouth is screened over to keep the audience from seeing the actors face behind the mask. The screen allows for the voice to be heard through the mask. The theatre mask was an integral part of Greek Theatre. Theatre for the Greek was part of their spiritual celebrations and the masks were a convention that allowed for the Gods to come to life in the arena. The knowledge we have of the masks comes primarily from sculpture and painting. Many copies of this mask have been made since its creation. 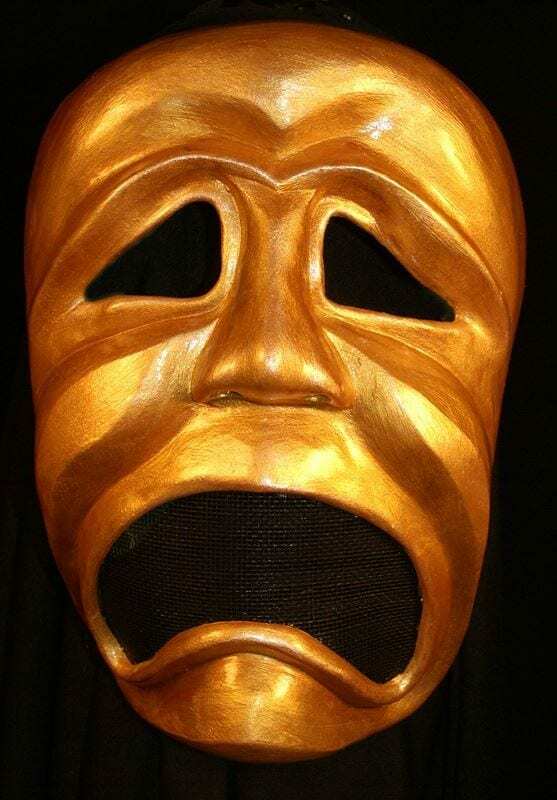 It is a popular mask for thespians world wide.